For years we have been watching as states loosened up on their respective marijuana laws. While the flux continues at the state level, marijuana remains illegal at the federal level. That has made it extremely difficult for legitimate marijuana-related businesses to find banking services. That’s what the House Financial Services Committee Chairwoman, Maxine Waters (D-CA) is trying to change. While some Republicans remain skeptical, enough joined the Democrats to approve a bill (45-15) that would help significantly. The committee will issue a report sending the Secure and Fair Enforcement (SAFE) Banking Act to the full House recommending it for further consideration. If it passes the House, which we expect, it is expected to face a much more difficult battle in the Senate. Although, Sen. Elizabeth Warren (D-MA) and Sen. Corey Gardner (R-CO) have resurrected a bill they introduced in the Senate last June. Its aim is to allow the states in which marijuana is legal (either medicinally or recreationally) to determine how to handle such businesses even though the practice is still illegal under federal law. The States Act, as it is referred, would exempt businesses from federal prosecution as long as they are following state (or tribal) laws. Both Massachusetts and Colorado have legalized marijuana for adult recreational use, so both Senators have a vested interest in the subject. The fact that marijuana is still illegal at the federal level. The Drug Enforcement Agency (DEA) categorizes marijuana as a Schedule I Controlled Substance, like heroin or ecstacy. They believe this classification should change prior to changing banking laws. Others fear that banks could get in trouble with anti-money laundering regulations. This could happen if a legal marijuana producer overstates production to cover up the fact they are purchasing from the black market. While both are valid points, there are other considerations. The first and foremost is safety. Without access to banks, marijuana related businesses are forced to handle all operations in cash. According to Rep. Steve Stivers (R-OH), one of the bill’s co-sponsors, the whole point is to take cash (sometimes very large amounts) out of these businesses making them safer for both employees and customers. In addition to safety, there is a very real financial benefit to allowing banks and credit unions to bank marijuana businesses. Banking will make these companies much more transparent which will ultimately translate to increased tax revenue, possibly billions. Of course, this would only apply to financial institutions in the state where the sale of marijuana is legal (see chart on page 7). But that’s growing. 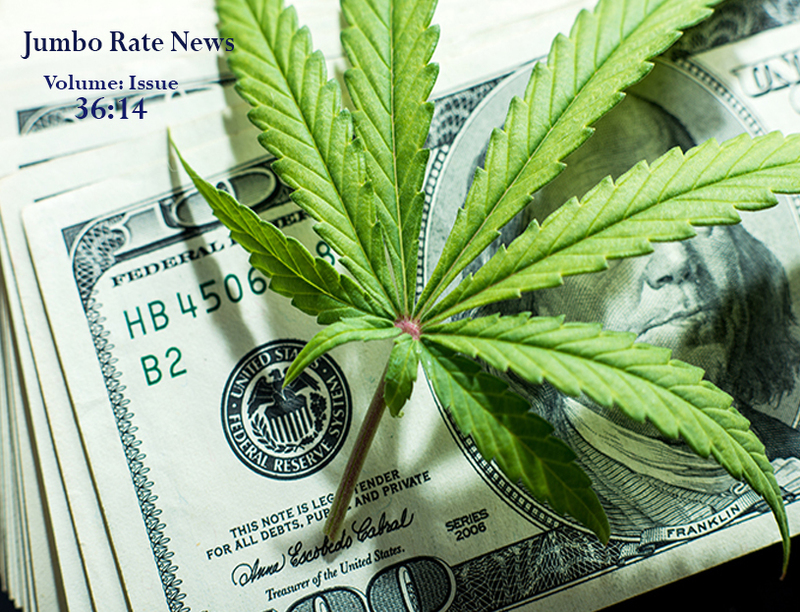 According to a January report from Arcview Market Research and BDS Analytics, legal cannabis sales hit $12.2 billion world-wide in 2018 and are expected to grow 38% to almost $17 billion this year. A previous version of this report predicted legal marijuana sales to top $24.5 billion in 2021. What’s more, according to the same report, two of the world’s largest three legal medical marijuana markets are right here in the U.S.— California and Michigan. California should be making a bundle on marijuana related taxes, but with no paper trail it is almost certainly losing out on much of that. We are fairly certain this is what Senators Warren and Gardner have their eyes on as well. 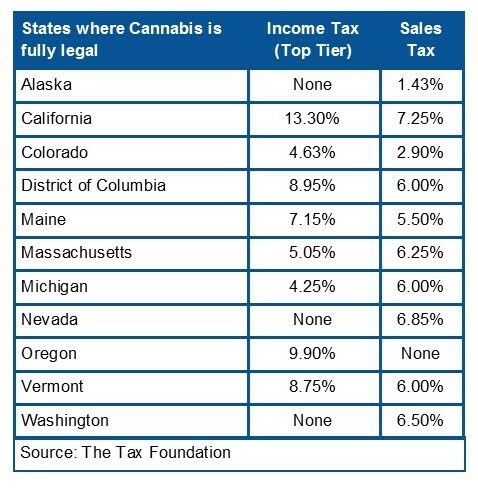 The following is a list of all states where marijuana is fully legal, along with their corresponding State income and sales tax rates. As you can see, there is a lot of money being left on the table.